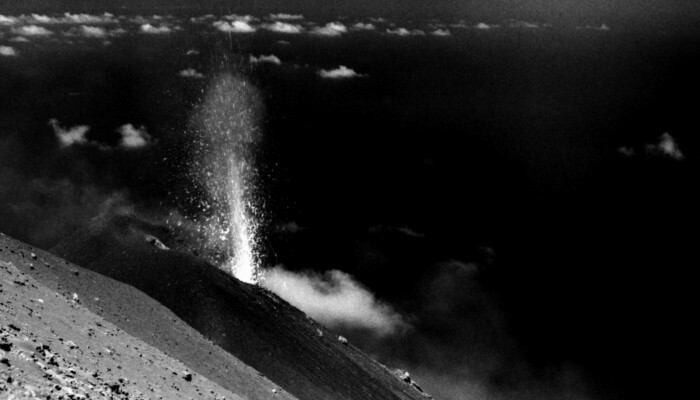 Jonas Kuhn, a researcher at Heidelberg University , took the photograph during a field campaign at Stromboli volcano in Italy. The objective of this campaign was to gather data from different gaseous compounds of the volcanic plume. Via emission fluxes of volcanic gases (e.g. SO2, CO2, halogen compounds…) or the ratio of emitted gases, one can retrieve information about the interior of the volcano and magma dynamics. Volcanic gas measurements can therefore contribute to better understanding volcanoes and in predict volcanic activity. There are several ways in which scientists can gather information about volcanic processes from plume gas measurements. Let’s start by taking a look at sulphur dioxide, as it is emitted by volcanoes in large amounts. A relatively novel measurement instrument, the SO2 Camera, is able to record 2D SO2 distributions with a high time resolution. This means that SO2 emission fluxes can be determined and linked to other volcanological data sets as e.g. seismic data or simply to the occurrence of explosions. The high resolution SO2 emission fluxe data can give insight into the footprints of volcanic processes like the bursting of gas bubbles in the magma. So depending on e.g. the viscosity of the magma one would expect different frequencies in the emission flux of different volcanoes. “In our group, a lot of work was done on further developing such camera systems. In volcanology this technique has only been applied for the past decade,” explains Jonas. Another innovative device for fast optical in situ measurement of SO2 andCO2, as well as chemical in situ measurements of halogen compounds in the plume was also tested during the field trip. By using the ratios of other gases to SO2 and the known SO2 flux (from the SO2 camera measurement), fluxes of the other gases can be estimated. Different gases have different solubilities in magma, so they are released from the magma at different pressures. Ratios of gas abundances in the volcanic plume can therefore contain information on, for instance, changes in the magma level (it’s not uncommon for magma to be ‘invisible’ in the interior of the volcano). The magma level can also be a crucial indicator of volcanic activity.